Krishna P Kaliappan, IIT-Bombay, elected to Fellowship in 2016. Kaliappan is a recipient of Prof. C. N. R. Rao National Prize in Chemical Sciences (2015) and the Swarnajayanti Fellowship (2007). 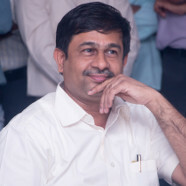 He received his PhD from IISc, Bengaluru, in 1996. Domino and multicomponent reactions are always attractive and they are expected to provide the target molecules efficiently in a shortest possible route. Our group has been engaged in designing simple and efficient domino strategies for the syntheses of biologically active natural products and natural product-like molecules. In this lecture, our efforts leading to syntheses of vinigrol, cyclic guanidines and N-heterocyclic amides will be discussed in details. Vinigrol, a unique diterpene containing the decahydro-1,5-butanonaphthalene carbon skeleton was shown to exhibit a broad spectrum of biological activity. Besides the multiple sites of oxygenation, vinigrol contains a tricyclic core having a cis-fused [4.4.0] system bridged by an eight-membered ring and eight contiguous stereocenters. We recently reported an enantioselective formal synthesis of vinigrol involving a 1-2-3-4 strategy: one pot and 2-reactions with the formation of 3-rings and 4-bonds leading to the core structure of vinigrol from its stereochemically well-defined acyclic precursor. The cyclic guanidines and N-heterocyclic amides are important structural units present in biologically active drug molecules. However, the existing methods suffer from harsh conditions, narrow functional group tolerance, poor atom economy, low yielding and so it warrants an efficient protocol for their syntheses. We have developed a one-pot Cu-catalyzed cascade routes to these unique cyclic guanidines and N-heterocyclic amides from readily available starting materials.